The Sharp® MAX-PRO 18 Automatic Bagger accommodates 18 in. wide bags with an 8 in. pass through depth. The unit comes with predictive maintenance and diagnostic abilities that constantly check data such as run rates and usage metrics. The bagger’s thermal printing technology prints bar codes, graphics and alphanumeric fonts directly on to the package. The Sharp SX GO table top machine can handle an 18 in. bag and a pass through of up to 8 in. Deerfield, Ill., October 3, 2018—Predictive maintenance, technology advancements and faster speeds are the cornerstones of the new Sharp® MAX-PRO 18 automatic bagger being launched by Pregis LLC at Pack Expo, October 14-17, McCormick Place, Chicago, Booth N-5136. Also being debuted, is the easy to use and compact Sharp® SX GO tabletop machine. “We believe that the Sharp MAX-PRO 18 is the most advanced bagger available and the first with predictive maintenance. It utilizes the Maxwell intelligent interface featured on other Pregis on-demand systems. The diagnostic abilities mean the system is constantly checking data such as run rates and other usage metrics so that it is able to notify a technician that there might be a potential service issue down the road. The ability to send that alert in advance of an actual problem results in no, or minimal, downtime,” explained John Hubert, director of engineering, Sharp Packaging by Pregis. The MAX-PRO 18 is ideal for large ecommerce and manufacturing operations with high volumes. Designed for easier operation, it has fast bag and pass-through changeovers. Sharp E-Z Bags® feed through the machine, are opened, filled with product, then sealed. The MAX-PRO 18 accommodates 18-inch wide bags with an 8-inch pass through depth. The unit also features an intuitive user interface and thermal printing technology which prints bar codes, graphics and alphanumeric fonts directly onto the package. The new Sharp SX GO table top machine is designed for operations seeking a simple, plug and play machine that requires minimal training. It is compact to fit into workstations yet powerful enough to meet peak season demands. The SX GO offers customers the first bagging solution specifically designed to address the challenges of ship from store fulfillment (space limitations, training) while gaining the benefits of improved shipping cost, speed and printed bags to enhance the customer experience. “It’s the only table top on the market that can handle an 18-inch bag and a pass through of up to 8 inches. It is also the only tabletop unit that can use fan-folded bags which mean fewer reloads. We’ve engineered it so that it only requires a couple of hours of training, for fast start-ups and companies employing seasonal labor,” Hubert said. Sharp flexible bags and bagging systems are used in a wide variety of applications including e-commerce, medical/pharmaceutical, retail displays, injection molding, linen services and OEM parts. 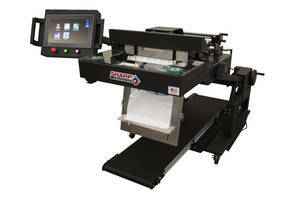 The Sharp product line includes MAX and SX bagging systems and custom-made E-Z Bags®. Pregis LLC is a customer-driven solutions provider of innovative protective packaging materials, equipment systems and surface protection. As a material neutral company, the company works with its customers to find the right solution to solve their business challenges. Pregis serves a wide variety of consumer and industrial market segments including food, pharmaceutical, healthcare, medical devices, agricultural, e-commerce, retail, appliance, automotive, transportation, furniture, electronics, building/construction and military/aerospace. For more information: www.pregis.com. Case Liner runs up to 18 cycles/min. Automatic Bagging Machines are designed for tight spaces.